Offices and laboratories for Dairy Science faculty and staff are located in the Animal Sciences Building, 1675 Observatory Drive. Student reference rooms, study areas, and classrooms are also located in the building. 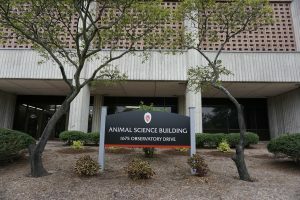 The building houses the Dairy Science Department, the Animal Sciences Department, the Center for Dairy Profitability, and the College Computing Facility. For general information call: (608) 263-3308. Cows right where our students learn! Used for both teaching and research, the campus Dairy Cattle Center is located one block away from the classrooms and laboratories of the Dairy Science Department. This facility houses 84 milking cows in a tie-stall barn. With a small teaching arena attached to the facility, Dairy Science Undergraduates have hands on access to cows during all lab practical sessions. The facility also employs students, providing them with a convenient opportunity to gain practical experience and earn some income while attending classes. Walk in visitors are welcome to view milking from 4:30 PM to 7:00 PM every day except during home football games. Campus facility tours are available based on area of interest and by reservation. Please call campus visitors center at 608-265-9500 for more information. The premier Dairy Research and Teaching Facility in the United States is located just 15 miles North of Madison in Arlington, WI. The Emmons Blaine Arlington Dairy Research Center houses 430 milking cows, 100 dry cows, and over 50 calves. This state of the art sand bedded freestall dairy facility was built in 2008. The facility allows for completion of pen based nutrition work, mammary and reproductive physiology research, calf growth studies, transition cow management projects, and individual animal intakes (via an Insentec research pen). For facility or tour information, please call (608) 846-5219. All tours must be pre-arranged. No walk in tours will be accommodated. Visitors are welcome to observe milking from 3:30 PM to 7:00 PM every day of the year. We started just over 100 years ago in Marshfield, WI. Those early professors and scientists had made a promise to start something great. A program that would benefit all area farmers.